Help us bring concrete hope to our fellowmen in their moment of greatest need. When giving online, please note that the currency is in Philippine Peso (PHP). If you live overseas, kindly make sure you convert the amount to PHP. Thank you! Donations can be deposited using the above account details at any NAB branch. If you would like a receipt, please send a copy of the remittance advice and your contact details (email address, contact number) through to finance.gka@gmail.com. Please note donations received by GK Australia are currently not tax deductible. 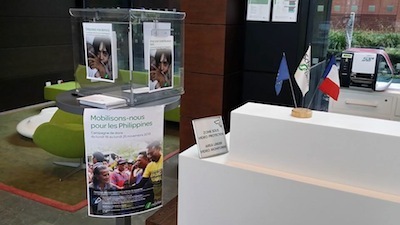 The Canadian government announced on Nov 10 that it has set up the Philippine crisis matching fund which will match dollar for dollar all donations made by individual Canadians to registered Canadian charities responding to the crisis, according to the report of CTV news. GK Canada is a registered Canadian charity with registration number 841583917RR0001. 1. Mail a cheque donation or automatic monthly payment by credit card by downloading the donation form and mailing it to the address stated on the upper left hand side of the form. Click here to download the form. 2. Banking email transfer. Pre-advise admin@gk1canada.com before you set up the email transfer to the Gawad Kalinga Canada bank account. Please send us the security code you used for the e-mail transfer in a separate e-mail, along with the donor's information: name, address, email address and phone number. Charity receipts are available upon request for all donations made over $20. Below are updates from our global family. For an update on other areas, visit the main Operation Walang Iwanan: Typhoon Yolanda page here. Hit for Haiyan is a charity tennis event/exhibition match organized by Columbia University alumni Mark Clemente and Mary Kuo to help with relief efforts for typhoon victims in the Philippines.The event, held on December 1 at the Hollandse Club, featured various fun tennis activities for more than 100 kids and adults. Organized in partnership with GK Singapore, the tennis fundraiser brought together the Singapore community to raise funds to benefit the Filipino people. It was a fun-filled afternoon of food, a live DJ, special face painting, raffle prizes, and fun tennis activities and games for all ages and levels. With the help of great tennis coaches and volunteers, all the participants truly enjoyed showing off their tennis skills and received some amazing prizes. The highlight of the event was the series of exhibition matches featuring some of Singapore’s top-ranked tennis players playing for a common cause: to help the Philippines. Hit for Haiyan provided not only people with the opportunity to play tennis, but more importantly, it brought a community together to share their generosity, support, and compassion for the Philippines. Hit for Haiyan was a great success, raising more than $15,000 in donations to help with the relief efforts and rebuilding of the 11.3 million lives affected by the typhoon in the Philippines. 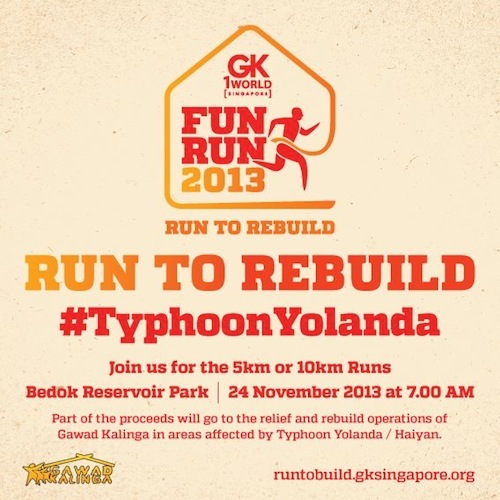 On November 24, GK Singapore held its first ever GK Fun Run to strengthen the Gawad Kalinga movement in Singapore, support community building programs, and help Typhoon Yolanda (Haiyan) survivors. The success of the event has gone beyond the race day itself. In the days following the event, GK Singapore received offers to help raise funds for typhoon relief & rebuild efforts and to volunteer for future events, not only from the participants themselves but also from their friends and families who learned about GK through the Fun Run. With this kind of response received, the team is now inspired to definitely make GK Fun Run an annual event to continue to inspire GK advocates in Singapore to “Run to Build” – to build hope, to build the GK movement, and to re-build lives. "Hi everyone! 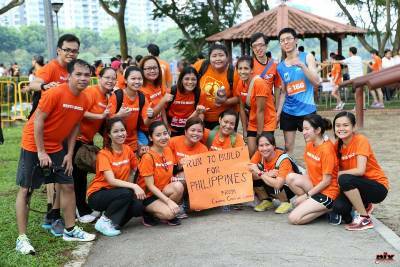 Last week while we’ve all been busy preparing for yesterday’s GK Fun Run, volunteers and donors have continued to work on raising funds to support GK Singapore and our relief & rehabilitation efforts for typhoon Haiyan victims. 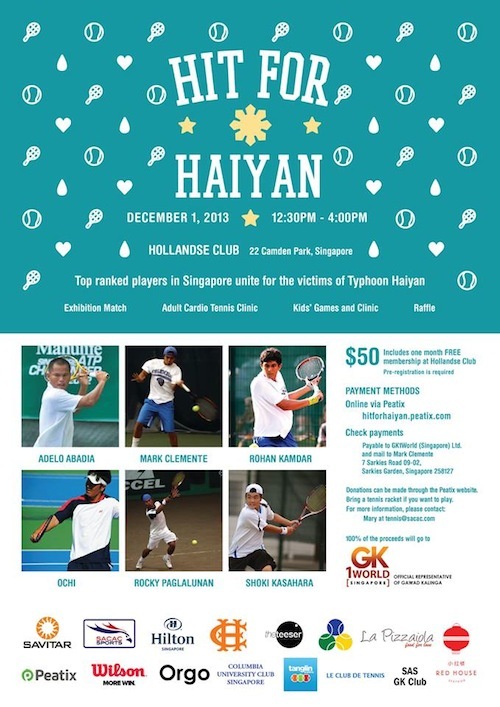 One such activity is HIT FOR HAIYAN – a fundraising tennis event where top ranked players in Singapore unite for the typhoon victims. The event is on December 1 (Sunday), 12.30 to 4.00PM at Hollandse Club. Please refer to the poster for more details. For further info pls contact Mary at tennis@sacac.com, or visit their event website for details on how to register. Thanks!" "Targeted for mid January of 2014, we are looking to celebrate the generosity of New Yorkers by hosting an event highlighting food from some of the most highly regarded chefs in the city, drinks from some of the most acknowledged bars in the city, with music from world renowned DJs all under one venue. Aside from ticket sales, a silent auction is also envisioned to increase the amount of money that we are able to raise for this cause. Through beverage sponsorships, chef and bar partnerships, we are working very hard towards ensuring that 100% money generated would go directly to the fund. We are looking to partner with Gawad Kalinga and GKonomics, their social enterprise and development partner to look into projects that would be sustainable, after all the relief workers are gone and the people of those affected areas go back to their daily lives. Our goal is to support all those that had survived the devastation and assist them by rehabilitating their farms, or diversifying their livelihoods so that they can rise up from this calamity, and be afforded the dignity to return to tilling the lands and fishing from the seas that have been so generous and have sustained them in the past." 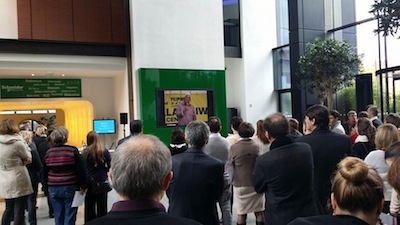 "This Thursday was a special Day at Schneider-Electric HQ in Paris (2,200 employees). Dedicated to the Yolanda victims and their fund-raising campaign to help through GK." "Tito Tony's speech for them was showcased on a HD set in the main lobby after Gilles VD (SVP) and I presented what is GK and after we watched as well the other dedicated video on GK Walang Iwanan operation." "Indeed, Luis' picture was everywhere... including in all elevators and TV screens." "EXTRA EXTRA..READ ALL ABOUT IT!! More & more restaurants are now participating!!! I want to give them a special shout out because this event tomorrow is possible with their participation! 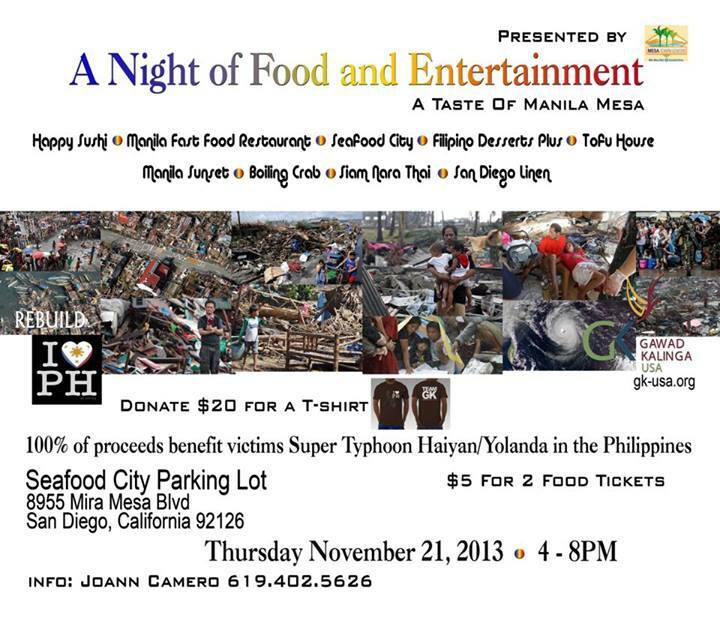 Don't miss the "Taste of #MANILA Mesa" @ Seafood City Parking Lot in #MiraMesa 4-8pm. $5 will get you 2 food ticket to taste any of the following restaurant's yummy food: Manila Fast Food, Siam Nara, Grill City, Manila Sunset, Boiling Crab, Tofu House, Filipino Desserts Plus and of course Happy Sushi! Plus enjoy the music organized by Erasmus Entertainments! 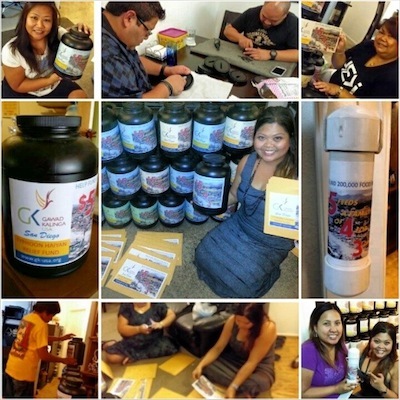 100% proceeds to Typhoon #Haiyan via #GawadKalinga #GKUSA #WalangIwanan and of course #TeamBalch will be there. PLS SHARE!" Gawad Kalinga Canada witnessed an outpouring of compassion and benevolence from Filipino-Canadians during its Kapit Kamay sa Pagdamay (Together in Compassion) Emergency Fundraising for typhoon ‘Yolanda’ victims last Nov. 16, 2013 at the Franciscan Church of St. Bonaventure Parish Hall at 1300 Leslie St., Toronto. Funds raised for the evening is estimated at $6000. Donations raised from the event will be used towards the rehabilitation, relocation and reconstruction of homes damaged and destroyed during the Nov. 8 super typhoon Yolanda/Haiyan, the strongest typhoon on record with sustained winds of 235 km/h and wind gusts of 275 km/h made at landfall. 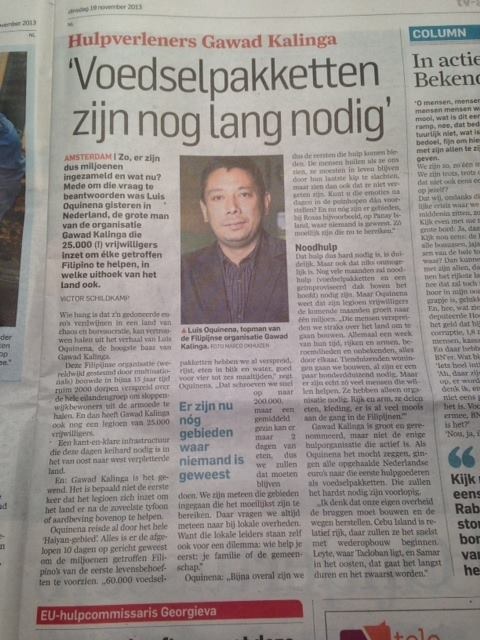 "2 Interviews alone with Gawad Kalinga Executive Director Jose Luis Oquinena with Dutch national papers AD and Telegraaf have reached 90% of the Netherlands, in addition the other 5 interviews have been featured in the regional papers. 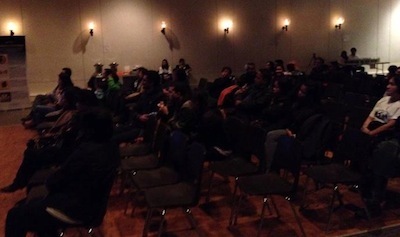 All Journalists were moved by the stories of the survivors and support GK as the No1 local Filipino organisation. Kuya Luis was recognised at Schiphol Airport when we bought the newspapers." Read the full article translation HERE. "Paris, Nov 19, American Cathedral. 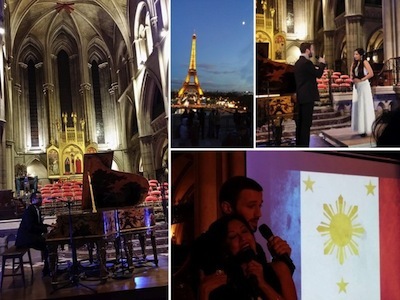 A fund-raising concert with Stéphanie Riess, splendidly organized by Mimi Agbay-Duhamel, for Gawad Kalinga France and another filipino charity from the West Visayas. With Ambassador Cristina Ortega. And 200 People. 6300€ for both charities. Beautiful artists, beautiful music and a moving expérience. Bangon Philippinas!" "We are here to honour the survivors and thousands of GK volunteers," Gawad Kalinga Executive Director Luis Oquiñena shares with the leading 7 Dutch newspapers and magazines. The journalists were left teary and inspired by the many stories of resilience, kindness and human spirit amidst the destruction of Haiyan/Yolanda. In the evening it is Kuya Jose Luis Oquineña and myself who are left humbled and emotional as we take part in the national Dutch TV appeal for the Philippines. I'm not often lost for words, but tonight to see the Dutch raise more than Euro 15 million in one day is leaving us ever so determined to rebuild our nation! To the survivors: The global community cares and are looking for you! 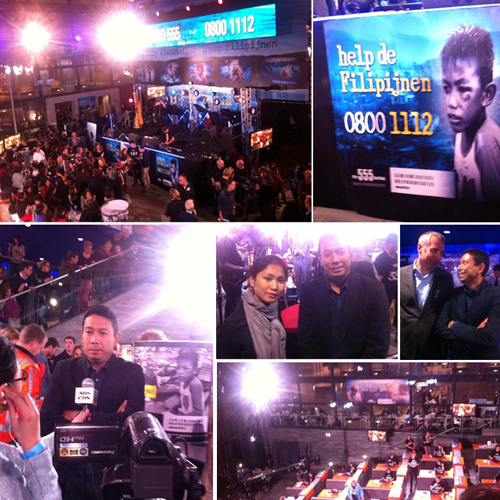 Thank you to everyone who made Kuya Luis 15 hours visit from Typhoon hit areas to Central Amsterdam happen!" SAN DIEGO — There's a special Tagalog word for the magic that filled the lobby of the movie theater at Hazard Center Saturday evening: Bayanihan. 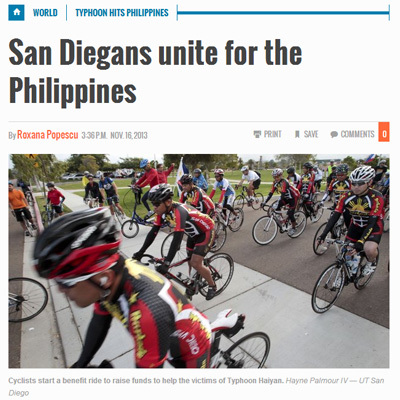 "It's basically a group of people coming together for a common cause," said Derick Aguinaldo, a volunteer with Gawad Kalinga USA, a nonprofit that has been raising funds to support victims after a super typhoon devastated the Philippines. Aguinaldo's group, a host of other charitable and community organizations and a crowd of San Diegans came together for an evening of food, music and film during the finale of the San Diego Asian Film Festival. They were all there for one reason. 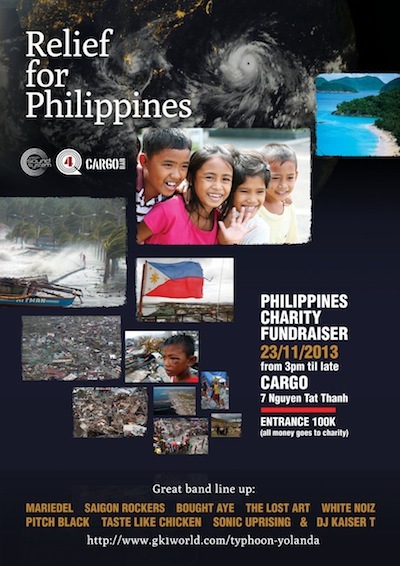 Well, two: to raise money for the typhoon victims and to have a fabulous time...Read More. 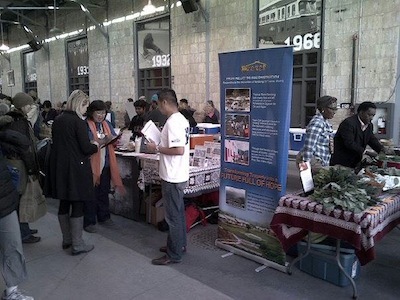 "Team GK Canada at Wychwood Barns for Typhoon Haiyan campaign. The fundraising was a success. Within 4 hours, we had over 200+ people stop by our booth. The sympathy was overwhelming. 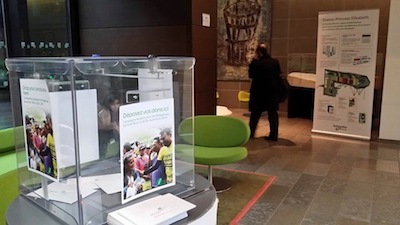 People wanted to be engaged and asked questions about GK and what it does. Donations were taken on the spot and others will do it "on-line" as they will use their credit card. All the donors were Canadians. We captured 90+ names in our database so we can issue them a charity tax receipt. We even got invited by a school (the Principal was in the market) to speak and present to their students. The MP (Member of Canadian Parliament) and local councillor who invited us were present and were very happy with the turn-out. Thank you to volunteers - Evelyn Pagkalinawan, Agnes Lopez Manasan, Jorge Lee and Jose Querubin who helped man the booth and collect donations. Rise up Philippines!" "Long but productive day. Not used to posting my daily whereabouts, but for this good cause, I'm happy to do so to inspire others. Got called last minute to attend SD Chamber of Commerce mixer in downtown; Yay! I was able to raise $$ in 2hrs! 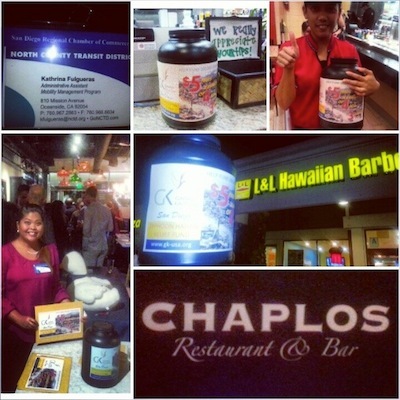 :) Then dropped of two 5-4-3 jars: 1 to Shanyn to bring to work at Tender Greens Restaurant and 1 at L&L Hawaiian Bbq in Carmel Mountain c/o Fred Amano. GK USA Co-volunteers are doing the same all over. You cam help too! ****5-4-3 jar stands for: $5 will feed family of 4 for up to 3 days!!! 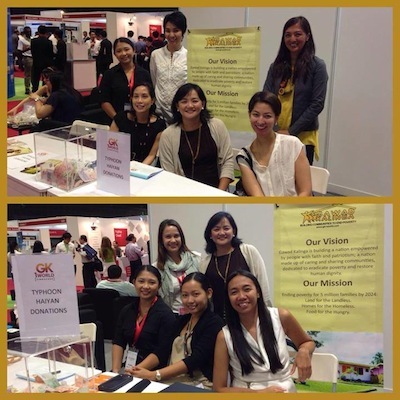 See it doesn't take a lot to help***"
Lovely GK Singapore volunteers shared their time & charms today to help raise funds to support GK Operation Walang Iwanan: Typhoon Haiyan, at a booth generously given for free by the organisers of the CLOUD EXPO 2013 event in Singapore. On top of already donating SG$10,000 to the relief operations CLOUD EXPO 2013 allowed us to set up a booth so we can collect more donations from their delegates! We invite you to share your stories of how your are doing your part to help the typhoon victims rebuild their lives. Walang iwanan! Let’s all be someone’s answered prayer. In the spirit of “walang iwanan” (“leave no one behind”), proceeds from the donations made through the run will now be channeled to support Gawad Kalinga’s relief operations for the victims of typhoon Yolanda/Haiyan. We have EXTENDED the deadline of online registrations to accommodate more people who would want to help, and we will also be accepting PERSONAL sign-ups and donations at the GK1World Singapore office until 17th Nov.
Run to Build Hope. Run to Rebuild Lives. 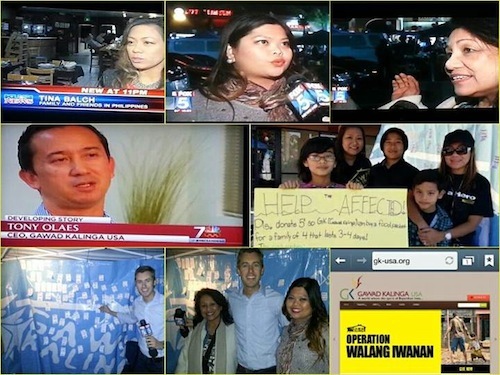 Advocates of Gawad Kalinga "to give care" on ABS, CBS, KUSI, NBC, FOX and other local SD news encouraging everyone to be a hero >> www.gk-usa.org/donation << A $5 donation provides 4people with food/basic need. GK in Philippines have massive volunteers who are now repacking and preparing relief goods for those who are affected by Haiyan. Please donate and help spread the word.